This academic year has been a year of growth and development in the library facilities, resources, and services. Much of this growth has been made possible through the contributions of many donors. Our services have increased and our collections have grown due to the support received through the generosity of different agencies and individuals. The library received 16 new Compaq computers and one laser jet 4600 color printer as part of a grant from the European Union. Eight of these computers are available for students’ use for Internet access and other electronic resources. Eight computers have replaced old models in staff offices in order to facilitate the work of the staff in the preparation of the online catalog and the production of other records. The U.S. Consulate General’s Public Affairs Office, Jerusalem has funded a subscription to Electronic Journals Service (EJS), enhanced version from Ebsco International. The service provides direct access to abstracts and full text for all subscribed journals received in hard copy as well as direct viewing of table of contents, abstracts, and full text of thousands of electronic journals in Ebsco’s system. The library received more than 1,500 books from the private library of the late Professor Edward de Moor of the University of Nijmegen, Netherlands. His widow chose our library as the site for this collection. The books are in Arabic, English, and French, and treat primarily of Arabic literature and other topics of Arab interest. Orbis Books and MISSIO/Munich awarded the library a book grant to aid Catholic libraries and research centers in developing countries. Fifty books from Orbis Books Publisher that treat of religious and spiritual topics were added to our collection through this grant.rant. French, and Arabic cover a wide variety of subjects including Palestiniana, Arab countries, literature, fiction, and biography. Professor Herbert C. Kelman of Harvard University, Department of Psychology has sent us a large collection of recent journals in psychology. This project was coordinated through Dr. Vivian Khamis. Development Cooperation Ireland (DCI) has funded a grant to purchase fifty books in public administration, accounting, management, human resources, public finance and related topics. Students in the Faculty of Business Administration can profit from these additional resources. In addition, DCI has funded the purchase of books and journals to support various programs in the Faculty of Nursing including emergency program, neonatal nursing program, occupational therapy, and physiotherapy.rapy.rapy. United Nations Conference on Trade and Development (UNCTAD) has provided us with this year’s Report on UNCTAD Assistance to the Palestinian People and a full set of UNCTAD reports and studies on the Palestinian economy published over the past ten years. The French Consulate in Jerusalem has provided a small collection of books in French. They will be a valuable contribution and an important resource for students who are learning the French language.uage. The Institute of Community Partnership (ICP) transferred 120 books and various AV equipment to the library collection. The books cover a variety of topics in business areas. These and many other contributions received from those who support us in our mission of education add greatly to our library collections. None of these additions would have been possible without the generosity of the donors. I am extremely grateful to those who provide these additions.ions. 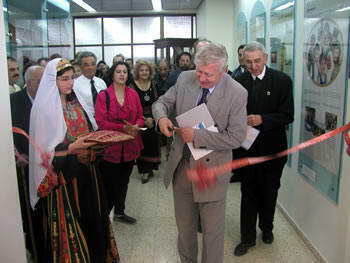 Dr. Niall Holohan, Representative of Ireland to the Palestinian Authority was present for the official dedication of Turathuna: Center for Palestinian Heritage. Development Cooperation Ireland funded the establishment of this center whose aim is “to contribute to the emergence of Palestine’s national and cultural identity. We see the role of the center as providing a showcase for this heritage.” Six additional display panels have been completed and more artifacts including a grinder and Palestinian embroidery were donated recently. The guests including members of the Board of Trustees, faculty and staff, and representatives of local schools and cultural centers had an opportunity to experiment with some of the available computer technology. In his remarks Br. Vincent Malham expressed appreciation to the researchers, technicians, consultants, and donors who assisted in the creation of this facility. The course in Library Skills (LIBR 101) was offered for the first time. This seven week course required of all first year students provides information and helps students develop skills necessary for academic life. Research strategies including selection of a topic, using information sources and preparing a seven item bibliography are components of the course. Mr. Anan Hamad is the instructor. An evaluation of the pilot program was conducted at the conclusion of the year and a report was distributed. It’s interesting to note that one student in the course was assisting a fourth year student in the proper way to cite sources for a bibliography. Through the combined efforts of Ms. Elsa Hazboun, Director of Personnel Management and Mr. Issa Bandak, Instructor in the Faculty of Business Administration students participated in a project to raise funds for the Bethlehem University Library Scholarship Fund. A desk calendar with photos reflecting the local culture was created and the students had a chance to practice principles learned in their studies by selling the calendars. The most rewarding aspect of the project is the knowledge that our own needy students profited from the work of the students in business. Bethlehem University Library participated in the first local book fair sponsored by the Ministry of Culture, the Arab Women Union, Cardinal House of Bethlehem, Bethlehem Peace Center, and Friends of Jabra Ibrahim Jabra. Almost 100 of our books were on loan for the exhibition that emphasized works by local authors and those that treat of Bethlehem. Books by Jabra Ibrahim Jabra and Edward Said were also included in the exhibition. Cultural and Educational Center in Beit Jala, and Evangelical Luteran Secondary School Talitha Kumi. Mohammed Esmael, a third year student with a major in Arabic and a minor in Journalism, from Dar Salah-Bethlehem, is one of the most active students in using and taking advantage of the library resources. Almost every day he spends about two hours using the Internet searching for his needs. His interest is in Arabic poetry, linguistics, grammar, novels, literature, and Islamic and language studies. He finds these resources are a great help in his studies, research and hobbies. Also, he is reading and using the books in the library for about one or two hours daily. Besides his use of the library, he is spending much of his time helping a third year blind Arabic major student, Awad Ebiat, in his studies. A room dedicated for students with special needs was established during the year. The Students with Special Needs Committee considered the priority to equip the room in order to serve the special needs of students with visual impairments. Equipment including a brailler, a braille embosser, two computers, a scanner, JAWS screen reading computer software program, screen zooming, and two cassette tape recorders with headphones have been placed in the room to assist the students with learning. The room is located next to the Library Director’s office. In addition, students can borrow books at the circulation desk from the National Society for the Visually Handicapped, Jerusalem for their leisure reading.